In 1944, Hope Seignious, Betty Hicks and Ellen Griffin founded and incorporated the Women'sProfessional Golf Association (WPGA). At that time, the newly formed WPGA was struggling untilWilson Sporting Goods came to the rescue in 1948. In addition, marketing director Fred Corcoranwas brought in to help keep women's golf in the public eye. The LPGA Tour is founded in 1950 and chartered in 1951. A handful of pioneering womenmake the fledgling LPGA Tour their "labor of love" by administering the tournaments whilecompeting in them at the same time for little or sometimes no financial reward. * Patty Berg is elected the LPGA's first president, and she is later succeeded in that role byLouise Suggs. * By 1952, the LPGA boasts a schedule of 21 events -- nearly three times the number oftournaments held just two years before. * LPGA Founder, Charter, and Hall of Fame member Betty Jameson donates the Vare Trophy to the LPGA Tour in 1952 in honor of women's amateur great Glenna Collett Vare. The Vare Trophy recognizes the player with the lowest scoring average at the end of each season. * The players of that early era greatly contribute to the success of the LPGA. Babe Zaharias,Peggy Kirk, Patty Berg, Louise Suggs, Marilynn Smith and Betsy Rawls add the individualflare needed to escalate interest in the LPGA. * The LPGA Teaching Division, renamed the LPGA Teaching and Club Professional (T&CP) Division in 1992, is founded in 1959. * The LPGA Tour prize money reaches $200,000 in 1959. The young LPGA begins to find its feet as women in sport gradually gain more acceptance. Thenumbers of tournaments and prize money are still scarce, but golf industry manufacturers step tothe fore to help with the continued establishment of an organized Tour for women golf professionals. The LPGA's first television coverage gives this growth a healthy boost in 1963. * Mickey Wright joins the LPGA in the early 1960's and her outstanding accomplishmentsgained the attention of the media, which helped the Tour prosper even more. * The 1960's see LPGA Hall of Fame member Kathy Whitworth win 53 of her now 88 LPGA titles. This is when the foundation of her title as the winningest professional golfer of all time begins. * The LPGA receives its first television coverage in 1963 during the final round of the U.S.Women's Open Championship. The first tournament to have national television coverage ofall four rounds was the 1982 Nabisco Dinah Shore. * By the end of the 1960's, prize money has grown to $600,000 and the schedule offers 34events. * In the 1960's, the LPGA Hall of Fame is established, with existing Women's Golf Hall of Famemembers Patty Berg, Betty Jameson, Louise Suggs and Babe Zaharias as its first members. A dramatic shift from a primarily player-run organization to a modern business, marks a pivotaltime for women's professional golf. The LPGA survives this make-or-break transition by hiring itsfirst Commissioner in 1975. The LPGA offices moved from Georgia to New York City, and bigbusiness backed by international corporate support springboards the LPGA into its next period ofgrowth. * Ray Volpe is hired as the LPGA's first Commissioner on July 8, 1975. As Commissioner, Volpe moves the LPGA headquarters from Atlanta to New York, creates a Board of Directors and appoints a player council. * Judy Rankin becomes the first-ever LPGA player to win over $100,000 in a season in 1976. * Nancy Lopez takes the LPGA by storm and sets a new record in 1978 by winning nine tournaments, including another record five in a row. * JoAnne Carner begins her dominance as "Big Momma" by winning 23 of her 43 career wins in the 1970's. * Jan Stephenson and Amy Alcott join the ranks of the LPGA and enhance the new-age style and character of women's golf with their winning performances and effervescent personalities. * Annual LPGA Tour prize money reaches $4.4 million in 1979. * During Volpe's tenure, purses increase from $1.5 million to $6.4 million. An influx of new young stars result from the influence of Title IX legislation and the sophisticationof women's sports programs in college and high schools. Such is the impact of the growingnumbers of young women turning to Tour golf as a profession that the implementation of an all-exempt qualifying system is required. Prize money and exposure continue their steady climb ascorporate America begins to shift its focus towards women's golf. * The first non-team sport retirement system is approved in 1981 and is initially funded with$400,000 of the LPGA's finances. * In the 1980's, players of the caliber of Beth Daniel, Betsy King and Patty Sheehan begin tomake their presence known as they challenge veteran stars for dominance of the Tour. * In 1981, Kathy Whitworth becomes the first LPGA player to cross $1 million mark in careerearnings. * John D. Laupheimer succeeds Volpe in April, 1982. Under Laupheimer's guidance, purses escalate from $6.4 million to $14 million, television coverage increases and the LPGA moves its headquarters to Sugar Land, Texas. After six years as Commissioner, Laupheimer resigns in July, 1988. * Pat Bradley records a phenomenal 1986 season by winning five titles, including three of thefour major championships, the Rolex Player of the Year Award and the Vare Trophy forscoring average. * William A. Blue is chosen as Laupheimer's successor in November, 1988. Blue moves the national headquarters of the LPGA from Sugar Land, Texas, to Daytona Beach, Florida. * In 1989, the LPGA makes a commitment to kids with the foundation of the LPGA Urban Youth Golf Program and the LPGA Girls Golf Club. * Annual LPGA Tour prize money reaches $14 million in 1989. Women's professional golf continues to break through new barriers as it evolves towards themillennium. The prosperity of the high-profile, multi-million dollar LPGA Tour continues to attractthe world's finest players to test their skills against the best in women's golf - all contributing tothe global feel of the LPGA. The wealth of youthful talent blends with the charisma of veteran starsto provide unmatched entertainment value. Simultaneously, the LPGA has continued to reach outbeyond its high profile stage to impact the everyday lives of the core golfers, women and childrenwith dynamic grass roots programs that make a real and lasting difference. * In 1990, the LPGA Tour announces two $1 million events, which are now the McDonald's LPGA Championship and the Sprint Titleholder's Championship. * After two years as Commissioner, Blue is succeeded by Charles S. Mechem, Jr. in November, 1990. Mechem officially serves as Commissioner from January, 1991 to December, 1995 and is instrumental in numerous positive advances for the future of women's professional golf. * The Solheim Cup, the first-ever Ryder Cup-type event for women, is introduced in 1990 andbecomes the most prestigious event in women's golf worldwide. In the three stagings of theSolheim Cup, the United States stands 2-1 over the Europeans. * Beth Daniel breaks new performance barriers by winning seven titles in 1990 and over$1 million in a 12-month period. * Pat Bradley, Patty Sheehan and Betsy King are inducted into the LPGA's Hall of Fame as itsnewest inductees, and discussions continue on the difficulty of entry. * The LPGA Foundation is established in 1991 as a charitable organization that benefits youthgolf and scholarships, a catastrophic illness fund for members, and the development of the LPGA Hall of Fame. * The first-ever Women in Golf Summit is held in 1991. The focus is on defining the issues inwomen's golf. It is so successful that there are two additional Women in Golf Summits: 1993and 1995. * The changing role of women in business makes a positive impact on the growth of the LPGA, and a number of clinics and seminars for women is conceived. * Purses grew from $18.4 million in 1991 to $25.3 million in 1996. The promotional partner and licensee family in 1996 totals 28. * In 1992, the LPGA T&CP Division hires its first full-time staff at LPGA headquarters. * The Susan G. Komen Breast Cancer Foundation is named the official national charity of the LPGA in 1992. The LPGA becomes the first professional golf organization to partner with an official national charity. * From 1981 through 1995, the LPGA raises over $78 million for charity. No other professional sport is solely dedicated to fund raising. * The Rees Jones-designed golf course at LPGA INTERNATIONAL, home of the LPGA, opens in July, 1994 in Daytona Beach. * Jim Ritts is appointed as the LPGA Commissioner-elect in June of 1995. In January, 1996, Ritts officially begins his tenure as Commissioner of the LPGA. * In 1996, the LPGA has five $1 million-plus events on its schedule and receives television coverage at 26 of the Tour's 38 events. * Annual LPGA Tour prize money reaches over $25 million in 1996. Source: LPGA 1996 Player Guide. 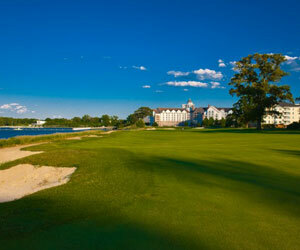 Save green while on the green at Hyatt Regency Chesapeake Bay Resort.